Teddy had a very difficult time deciding what kind of cake he wanted for his fourth birthday. He swung from Thomas the Tank Engine to Mario Kart to Oscar the Grouch. He even proposed incorporating all three into a complicated and bizarre cake where trains, Italian plumbers, and grouches live in harmonic world of sugar, buttercream, and a complicated set of tunnels for travel. I told him I was not able to grant that wish. I’m a mortal mommy. Finally, I made the executive decision to make a Nintendo cake. 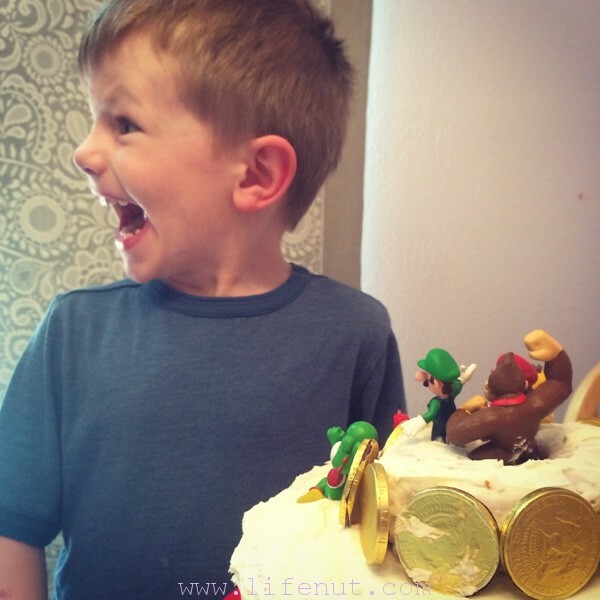 He adores Mario Kart and the family of characters. I had an idea for a cake that would be very simple and hopefully super fun. It was easy to assemble. I ordered the six Nintendo figurines from Amazon. The set includes Mario, Luigi, Donkey Kong, Yoshi, Toad, and Princess Peach. They are solid plastic and could be fun toys after the birthday was over. I baked two 9-inch rounds of strawberry cake, then frosted it with a typical buttercream frosting. 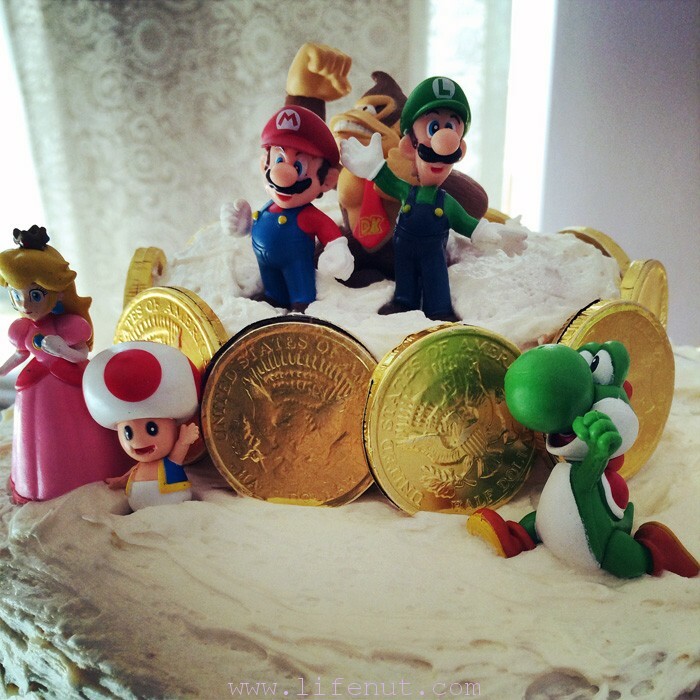 To make the platform Mario, Luigi, and Donkey Kong are standing on, I frosted a single raised donut and put it on top of the cake. 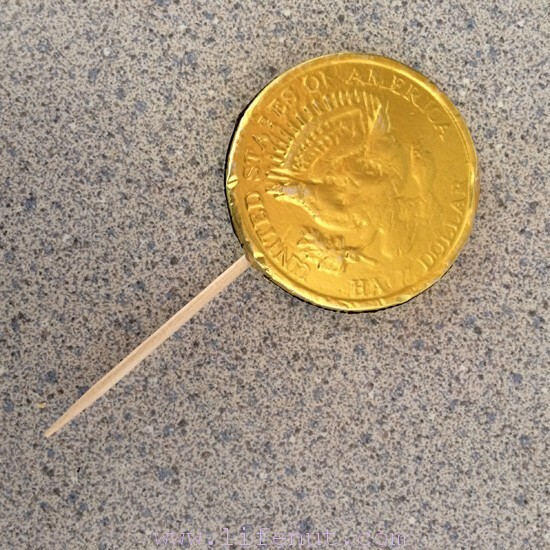 The gold coins were purchased from a candy store. They were tall enough to surround the donut. I opened the foil a tiny bit and slid a toothpick inside, then resealed the foil. I stuck the toothpicks in the cake around the frosted donut. Then, I arranged the Nintendo figurines where I thought they’d look cute, putting his favorites on top in a place of honor. They were heavy, so I had to press them into the thankfully-thick bed of frosting. If you make the cake, make sure you have plenty of frosting so they don’t tip over. I put the cake in the refrigerator so the frosting would harden and took it out right before we sang. Teddy was thrilled with his cake! He loved it and so did the other kids. You are so clever and creative. Teddy will remember his special cake. I know it was well worth the effort and I’m sure it was as yummy as it looked. You could sell decorated cakes in your spare time…but wait…you probably don’t know what spare time is!